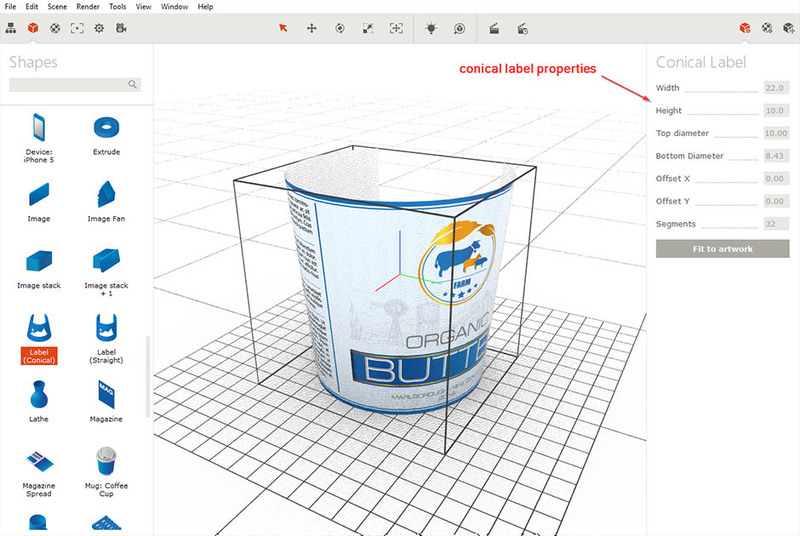 Boxshot lets you make 3D conical labels looking fine in 3D. 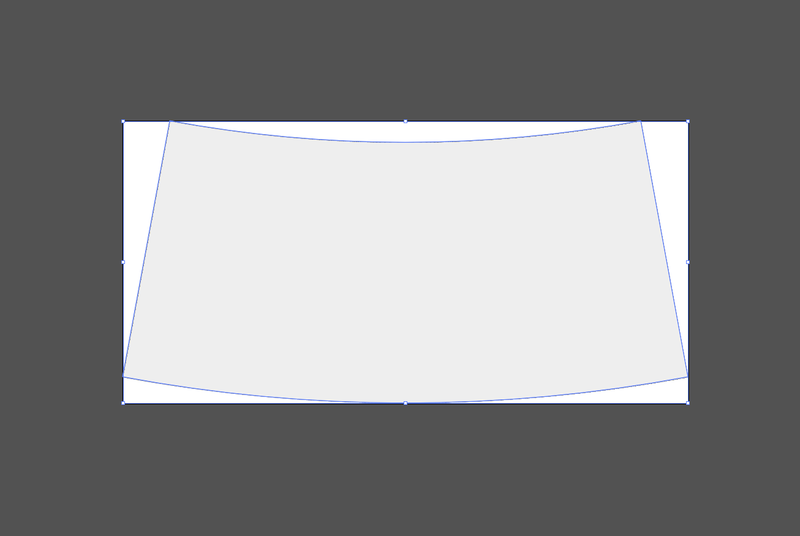 In order to do so, you need an image with distorted artwork that Boxshot loads and applies to the shape. The tutorial below shows the process in details. 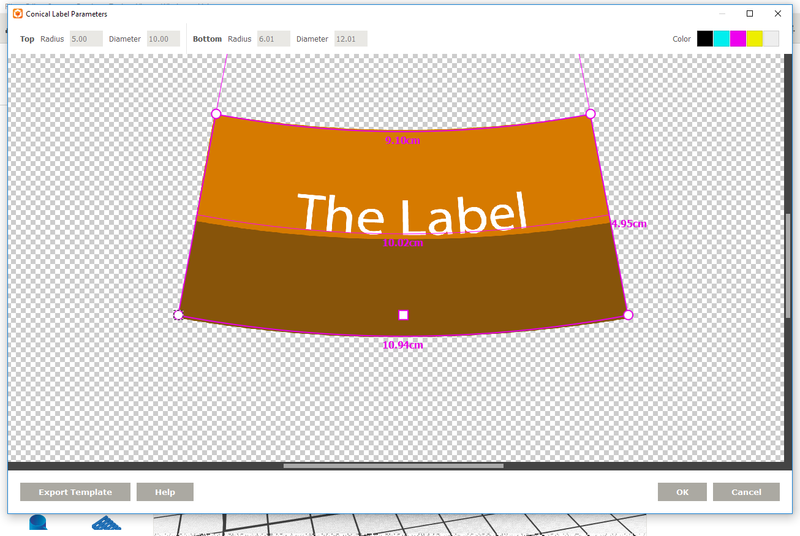 You'll see a conical label with default texture. 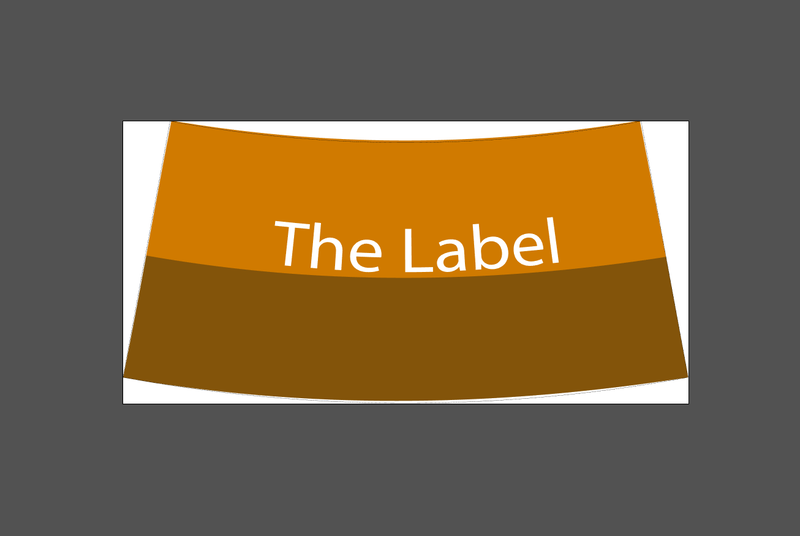 The bottom radius of the cone is smaller than the top, this label can fit a bucket or something similar. 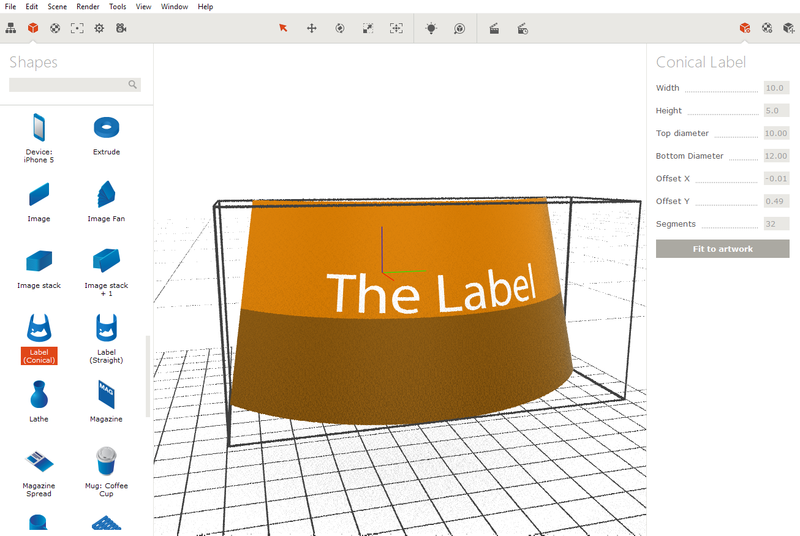 The thing about conical labels is that they need a special "distorted" artwork, so once applied to a conical surface it looks properly aligned. Boxshot expects you to provide such artwork and lets you map it to the shape you created. Once we changed parameters, Boxshot updated the shape. It looks fine, but the image is applied wrong and a transparent area is added at the bottom. The reason is that we need to provide a properly distorted artwork once we changed the cone or label dimensions. It is the essential part when working with conical labels both in Boxshot and in real life. 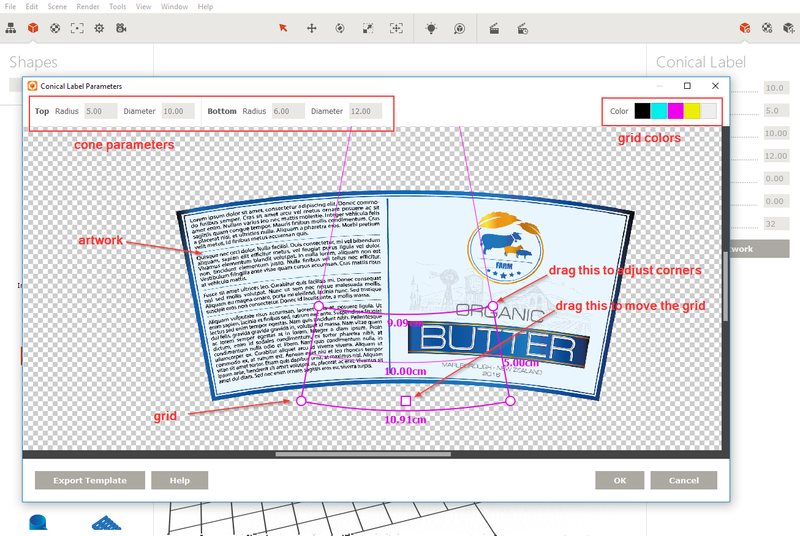 You need to click Fit to artwork to open the artwork editor for conical labels. You see the artwork in the middle overlayed with magenta frame - the grid. 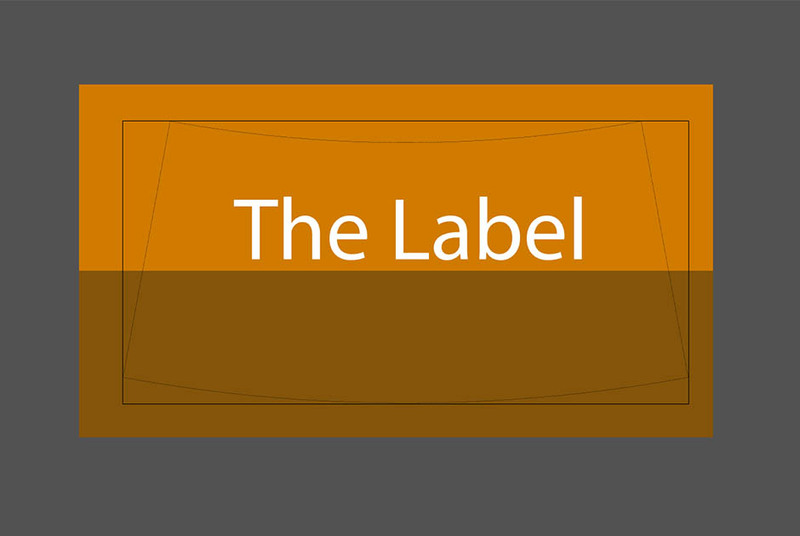 The grid defines which part of the artwork is used for the label. The shape of the grid is defined by both label's width and height and cone's diameters. 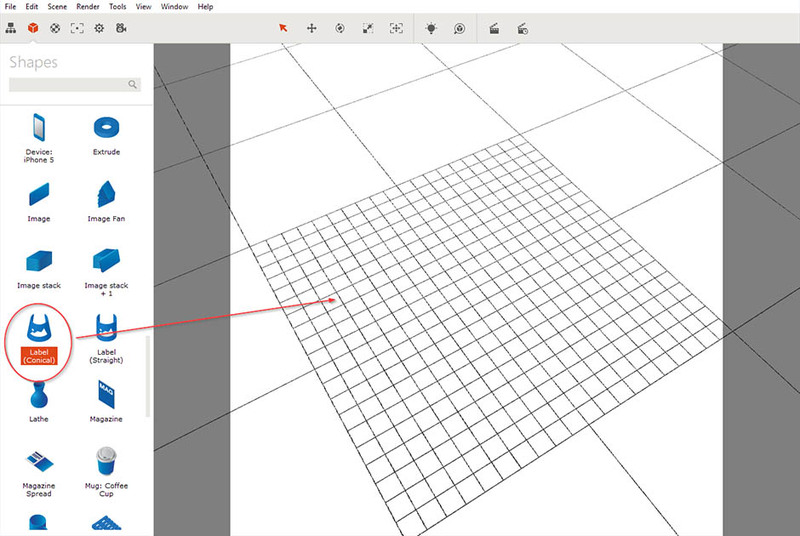 You can move the grid by dragging its square handle and change the grid by dragging the round handles. Note that in the second case you'll also update the label and cone parameters. There is a toolbar at the top, showing cone parameters you entered before. The top diameter is 10cm and the bottom one is 12cm. The grid shows three widths (top, middle and bottom) and the height of the label. You can see that middle width is 10cm and the height is 5cm, exactly as we set it up above. Note that the grid doesn't overlay the artwork completely and there is a transparent area at its bottom. That's why you get that bottom part of the shape transparent. 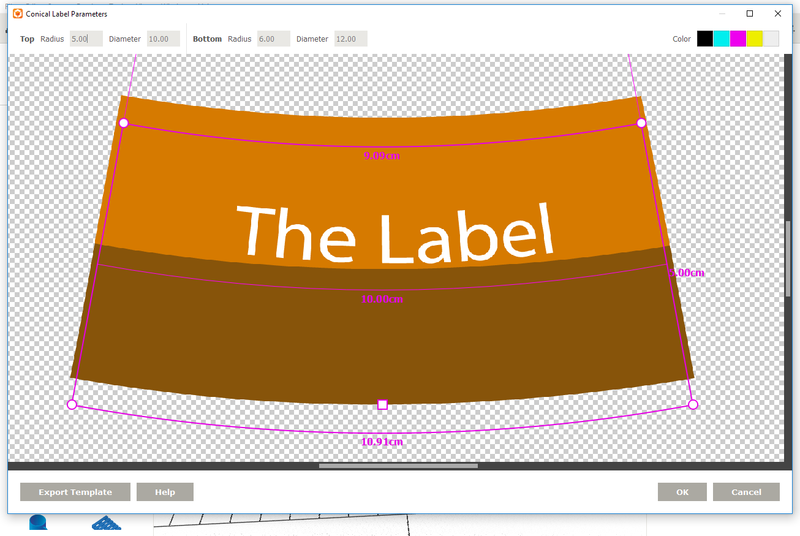 So we need a proper artwork for that exactly grid that we can later match and apply to the shape we've just created. 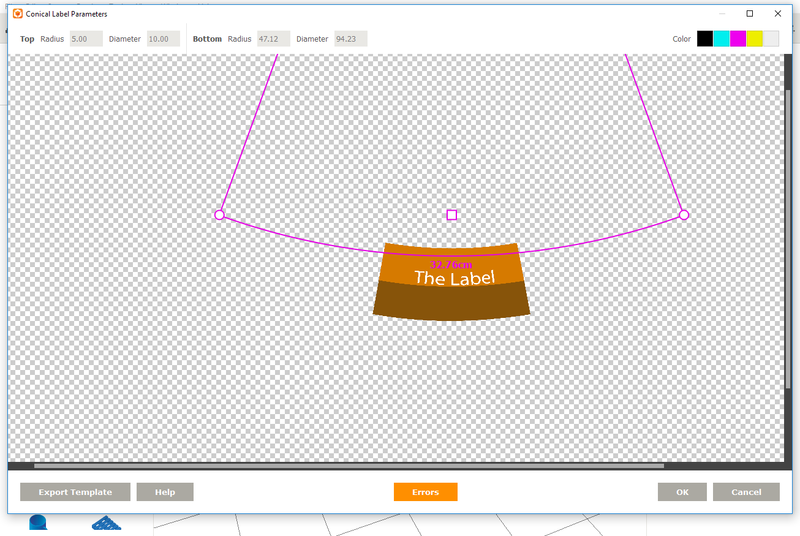 Boxshot lets you export a template that you can later fill with the artwork. 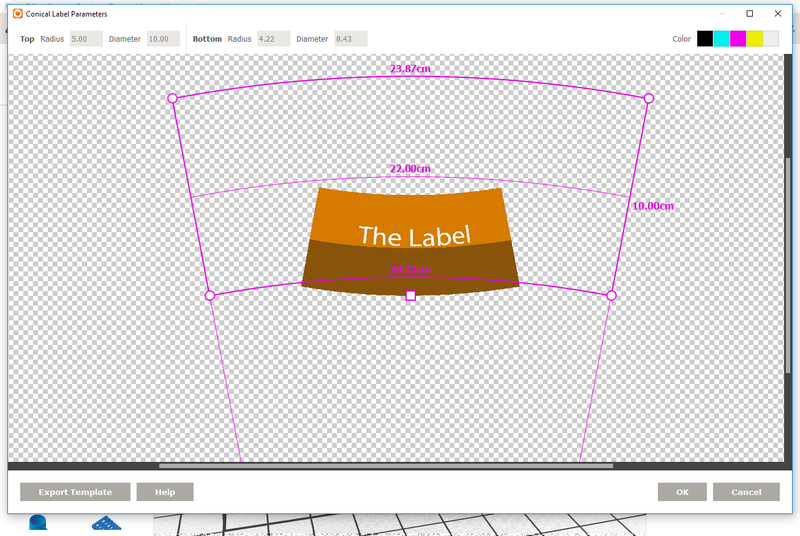 Click Export Template button at the bottom left corner of the window to save that grid template to SVG file. 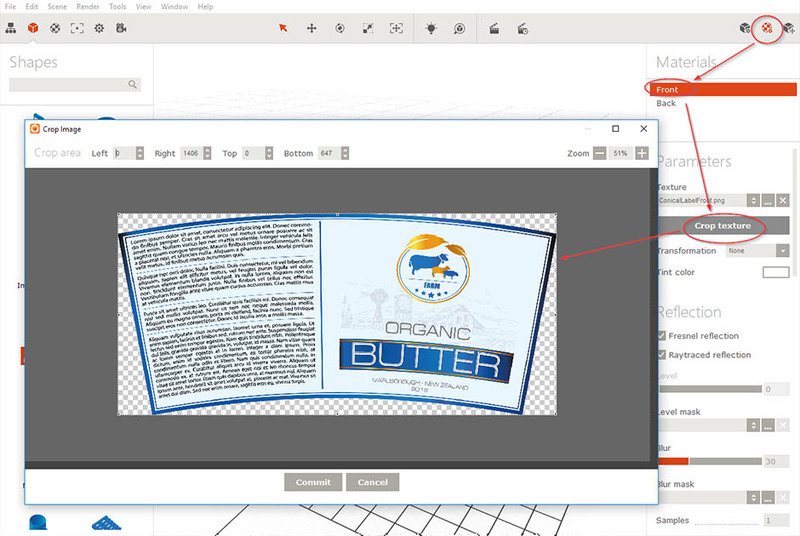 You can later open it in your favorite editor and make the artwork. You see that the horizontal line is perfectly parallel to the floor and the text looks vertical. The better you prepare the distorted artwork, the better results you get. What if I already have artwork? 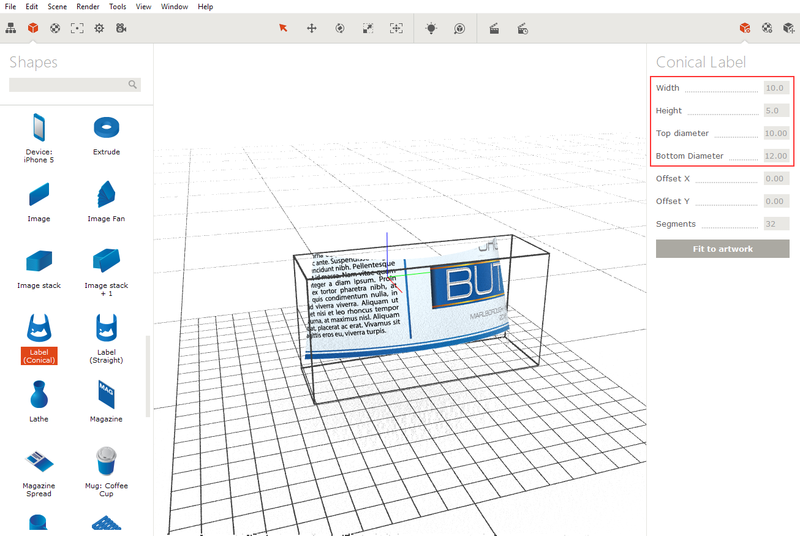 In that case you'd better setup the cone first, so Boxshot knows what diameters to use. The problem with conical labels is that you can't guess its size from the cone size and you can't guess the cone parameters from the label. You need to define both and Boxshot just helps you to speed the things up. You see the grid doesn't match the artwork, so we drag its round handles to align it. 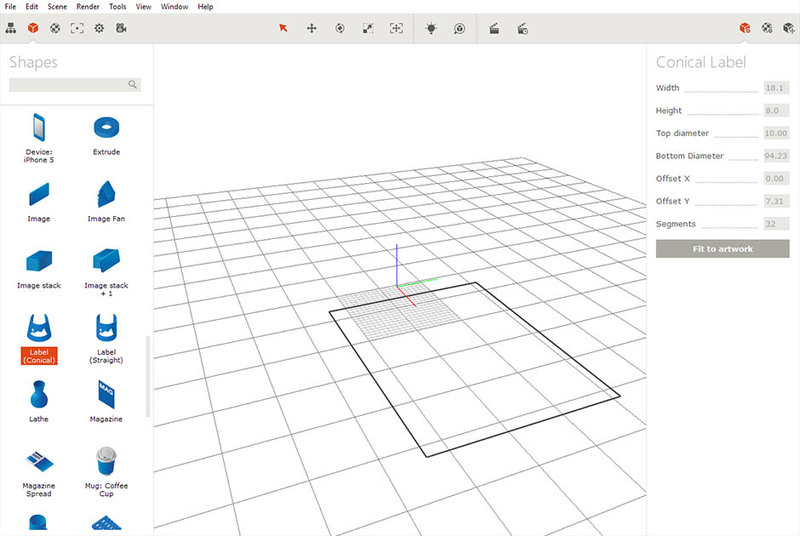 Boxshot automatically adjusts the other handles while you dragging one to make sure the grid is still a valid conical label grid. Great, it looks fine as expected. 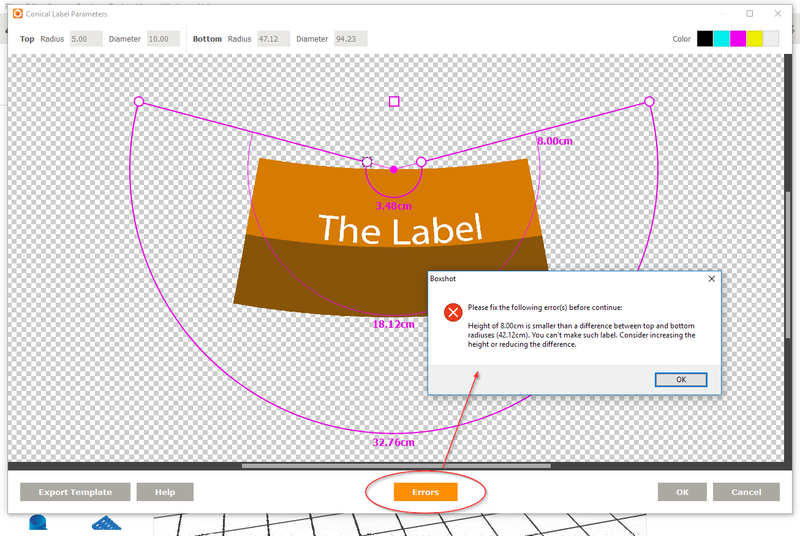 So once again: make sure your artwork has no errors when you click OK in the editor. This saves your time on re-making things, and also double checks that the artwork will fit the real shape when printed.